How could anyone vote this less than six?!? I really really don't know what voters think but I know what I think. I think I see you as one exceptional artist - your mastery of light and shadow and texture and color is amazing. 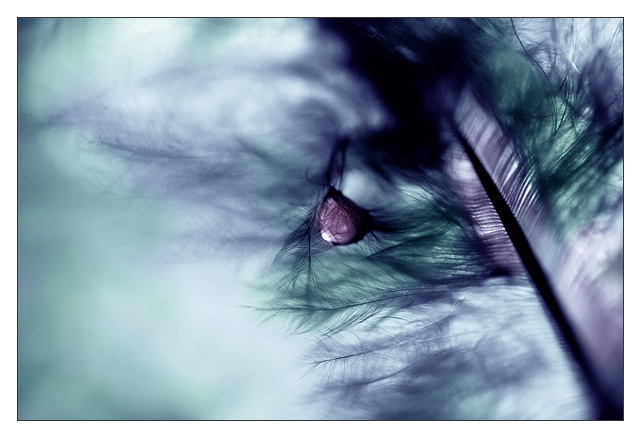 I see a feather. I think maybe a drop of water? Not sure how the title ties anything together. Not really sure at all on this. But hey, I'm just one person. Pretty colors though! Wonderful muted colors. I wish there was a slightly better composition. Although I do not generally like centered subjects, it would be okay in this instance, except it is just slightly to the right. I would try and crop some of the left off so as to center it completely IMHO. great picture - love the carefully moderated DOF and the cool color scheme. Proudly hosted by Sargasso Networks. Current Server Time: 04/22/2019 04:24:48 PM EDT.